Today, the Clean Water Act is 40 years old. Though it brought substantial benefits to urban areas, water quality problems — some old, some new — persist in the United States. The Hartford riverfront, once polluted and unappealing, now draws more than a million people each year. 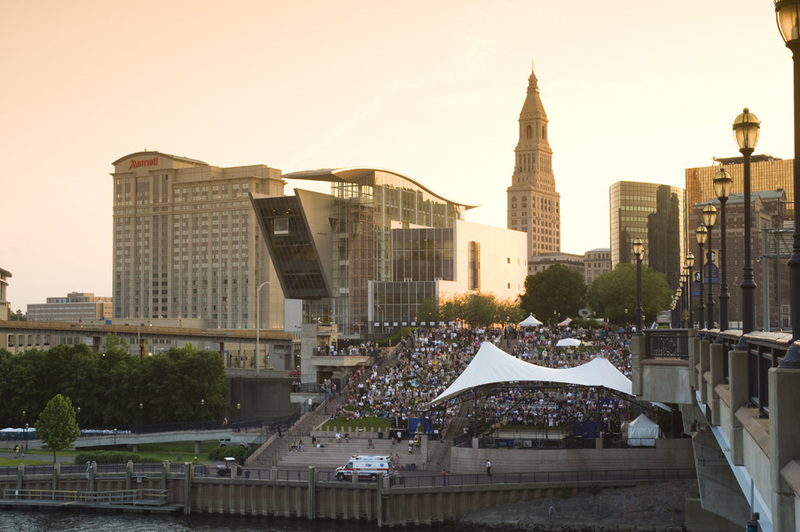 A riverside plaza, shown here, hosts concerts and festivals and is connected to downtown by a promenade over Interstate 91. For years, the stretch of the Connecticut River flowing through the state capital of Hartford was little more than a handy sewer, kept out of sight by a high wall. But over the last few decades, the city’s residents — parking lot by parking lot and acre by grassy acre — have clawed their way back to the river, altering not only the face of the city, but the course of its economic development. In many ways, Hartford’s waterfront renaissance can be traced to 1972, when the U.S. Congress passed the Clean Water Act, a landmark bill and a globally recognized model of environmental policy that made toxic discharges into waterways illegal and forced the most egregious industrial and municipal offenders to clean up their operations. Together with the National Environmental Policy Act and the Clean Air Act amendments, enacted two years earlier, the Clean Water Act was part of a new and virtuous line of environmental statutes that spurred capital investments, safeguarded natural resources, dramatically reduced air and water pollution, restored natural habitats, and protected public health. Aided by generous federal support, these environmental policies defied the predictions of stunted growth and economic collapse that were offered by many critics. The Clean Water Act and its companion legislation, in fact, proved that wealth and environmental protection moved in the same direction. The places where the law made the most difference: the nation’s cities. Metropolitan hubs that long ago turned their backs to the water are now facing their shorelines and have remade themselves, thanks to the benefits of healthy rivers and lakes. Hartford’s waterfront — like those in Boston, Charleston, Chicago, Cincinnati, Cleveland, Louisville, New York, Pittsburgh, and dozens of others — now pulses with new businesses, new offices, new housing, and throngs of people. In its 40 years, the Clean Water Act has, without a doubt, improved the quality of life and of water in the nation’s urban areas. Rivers no longer routinely catch fire; rather, they host swimmers competing in triathlons, are habitat for game fish, invite shoreline bars and waterside restaurants, and have fostered all manner of parks and recreational trails along their banks. And yet, for all their clean water successes, cities — because of the concentration of people and pavement — are still the source of some of the most vexing water-quality problems today. Instead of factories, the most persistent urban pollutants now come from non-point sources, the chemical-sodden drainage and bacterial leakage of modern human life. Some, like the flush of grime, oil, and dirt from surface roads after a hard rain, are a familiar nuisance. Others — such as the pills, potions, and lotions in the medicine cabinet that work their way into waterways after leaving our bodies — present new quandaries and uncertain threats. Still other pollutants, such as fertilizers used on lawns and farm fields, were well understood before the Clean Water Act was passed and still defy clean-up solutions now, 40 years later. Hartford’s isolation from its waterfront began in the 1930s and 1940s, when the city’s flood wall was built, according to Marc Nicol, the director of planning and park development for Riverfront Recapture, a nonprofit founded in 1981 that operates the city’s riverfront park system. Though Hartford’s flood wall remains, hundreds of acres of parking lot and despoiled land have been turned into an award-winning park system that has attracted more than $US 1 billion worth of development projects nearby: a convention center and a science center, hotels and shops. At least four apartment complexes are being built near the riverside promenades. And last year, roughly one million people visited the parks, in a city of just 125,000. More than just a legal document, the Clean Water Act transformed public perceptions, argues Ed McMahon, a senior resident fellow at the Urban Land Institute, a land-use policy organization. On October 17, 1972, President Richard Nixon vetoed the Clean Water Act, because he thought it cost too much — a complaint still made today by cities that are squeezed by expensive sewer-system renovations and pinched by cuts in federal funding for clean water. In deliberating the returned bill, the Senate was prodded by Maine’s Edmund Muskie, the main sponsor of the act. The CWA had a bold and ultimately unreachable goal: to eliminate polluted discharge into waterways by 1985. An interim benchmark was to make the nation’s waters swimmable and fishable. Nearly everyone can find fault with the U.S. Environmental Protection Agency’s oversight of the Clean Water Act. Those on the left and those directly affected by pollution contend that the agency has not done enough to protect the nation’s water. They point to statistics found in the 2010 national water quality assessment, a summary of data collected by the states. The assessment revealed that, of those water bodies surveyed, 53 percent of rivers and streams and 69 percent of lakes, reservoirs, and ponds did not meet water quality standards for all intended uses. Wetlands fared even worse, with 84 percent labeled as impaired. Getting the polluters to pay is another matter. A 2009 investigation by The New York Times found more than a half a million water pollution violations in the previous five years. Yet, fewer than three percent of violations resulted in fines or other punishment by the states, most of which have the power of administration and enforcement under the Clean Water Act’s federal-state partnership model. Whereas the left claims, “Not enough,” many on the political right shout, “Too much!” and argue that the EPA’s “long arm” is bullying the states and choking American business with onerous environmental regulations. The lament echoes loudest in the U.S. House of Representatives, where Florida Republican John Mica, chairman of the Transportation and Infrastructure Committee, introduced a bill that would give more power over water quality to the states. “EPA is now insisting on imposing its federal will on states with a federal, top-down, one-size-fits-all approach to water quality regulation that is taking away the flexibility that states need to address their water quality issues,” said Ohio Republican Bob Gibbs in June 2011 during a House subcommittee hearing on nutrient policies. Gibbs sponsored a bill to prevent the EPA and the Army Corps of Engineers from implementing new guidance on the scope of the Clean Water Act, because the agency did not go through the proper rule-making process. Legislation is one method; the power of the purse is another. For fiscal year 2013, the House Appropriations Committee voted to cut the EPA’s budget by 17 percent. The White House and Senate Democrats oppose the large cuts. To move quickly in that direction, the U.S. Environmental Protection Agency (EPA), which administers the CWA, required factories and sewage treatment plants to install pollution-control technology. Lawsuits in the late 1980s and amendments to the act in 1977 and 1987 pushed the EPA away from the one-size-fits-all technology standards toward an approach that focused on watersheds and water quality. Then, in 1994, the EPA put forward a policy on controlling overflows from combined sewers, the system of connected pipes that handle both stormwater from streets and sewage from homes and businesses. The EPA estimates that 3.2 billion cubic meters (850 billion gallons) of polluted water is untreated when it is dumped into waterways each year from these systems — far more than the estimated 37.9 million cubic meters (10 billion gallons) of untreated overflows from sanitary sewers. That policy has since become a fiscal weight for the 772 cities currently operating combined systems, as they struggle with the cost, often in the billions of dollars, of untangling their pipes and providing storage capacity to handle peak flows. Experimentation. Flexibility. Adaptation. These are the terms that EPA administrators, policy wonks, municipal officials, and environmental advocates use today when talking about the next phase of clean water in the United States. The new thinking represents a major shift from 40 years ago in how the Clean Water Act is interpreted. Mehan said this means that communities must propose creative solutions, while regulators have to be willing to accept novel approaches. Yet, the cold truth is that American society is only slowly acknowledging the systematic challenges that cut across sectors like latticework in the Age of Man. Whether the U.S. has the gumption and wherewithal to meet these new challenges is a matter of much debate; perhaps few societies anywhere in the world do. If the problem is a simple cause-and-effect — this pipe is discharging these pollutants —then we have solutions for that. In this regard, as Mehan and others have said, the Clean Water Act was a success. But the 21st century problems — a deluge of nutrients flowing into the Gulf of Mexico and the Chesapeake Bay; combined sewers that have a multi-billion dollar price tag to unravel; micro-pollutants from prescription drugs, soaps, and lotions — are an entirely different animal. What Kray says is undoubtedly true. But the biggest challenge facing the Clean Water Act is that a single piece of legislation, however effective, cannot command the stage alone. So the next act for clean water might be less like a headlining national production and more like the chaotic marketplace, a theater fringe festival, where bold ideas bubble up in the froth. It turns out that American cities are an apt stage to generate such ideas. Cleaner streets, safer neighborhoods, larger parks, restored waterfronts, rebuilt transit systems and other urban infrastructure improvements have coaxed people back to U.S. cities, especially bright young professionals. They have brought with them a new culture of connection and convening. All those Hi-fi wired coffee shops, linked offices, and text-ready watering holes have become rich nodes of idea generation and policy action. In some cities, water quality and river restoration is near the center of the civic conversation. Owensboro, Kentucky, along the Ohio River, passed a tax increase in 2009 to generate more than $US 160 million in public and private funds to rebuild its downtown and riverfront. Upriver, Cincinnati is spending over $US 1 billion to build a new park and mixed-use residential and office development along the Ohio, which is considerably cleaner because of the Clean Water Act. Grand Rapids, Michigan is seriously considering removing four dams and restoring the boiling rapids in the surprisingly cleaner Grand River, that for over a century has been remembered only in the city’s name. In an era of fiscal austerity, when the states and the federal government have mostly turned away from making big investments that help solve big problems, there is no appetite among lawmakers to delve deeply to strengthen the Clean Water Act. Improvements to water quality will come episodically and primarily from communities that view their cleaner rivers and lakes as competitive advantages. Innovation and highly targeted investments in improving water quality are the new script for urban development. This article is part of a series marking the 40th anniversary of the Clean Water Act. Click here to read Part II: A Harvest of Clean Water Exemptions on the Farm by Circle of Blue’s Georgia-based reporter, Codi Yeager-Kozacek. Click here to see a slideshow of vintage photos, taken before the Clean Water Act was implemented. If water quality improved, it was not because of the Clean Water Act, since EPA only requires only 35% of the pollution in sewage to be treated and fortunately most sewage treatment plants do treat their sewage much better. All this was caused by a faulty applied pollution test EPA used to implemented the Act, but as used ignored 60% of the pollution in sewage Congress intended to treat. Among the waste ignored is all the nitrogenous (urine and protein) waste, while this waste besides exerting an oxygen demand, also is a fertilizer for algae, thus contributes to the dead zones now experienced in nearly all open waters. In a recent Investigate West article (www.invw.org and wwwopb.org) an EPA spokeswoman states that urine is only a concern when effluents are discharged in ‘ammonia’ sensitive waters. She clearly does not realize that nitrogenous waste in sewage represents about 40% of the total oxygen exertion and that one pound of nitrogen can create 20 pounds of alga, that when it dies will again cause an oxygen exertion. It is obvious that when nitrogenous waste is not treated completely, one might as well discharge the sewage directly into open waters and this would save a lot of money. However if we really want to clean up our open waters we should first correct this essential test, so we finally will know how sewage is treated and what the effluent waste load is.